The Very Short Introductions (VSI) series combines a small format with authoritative analysis and big ideas for hundreds of topic areas. Written by our expert authors, these books can change the way you think about the things that interest you and are the perfect introduction to subjects you previously knew nothing about. Starting this week, OUPblog will publish a VSI blog post each Friday. Grow your knowledge with OUPblog and the VSI series! Engineering is everywhere. We rely on it totally and yet, most of us tend to take it for granted. Do you ever stop to wonder how the water gets to your taps or the electricity to your home? From the water we drink, the food we eat, the electricity we use, the tools we work with, and the gadgets that entertain us, to the cars, trains and aeroplanes we travel in, we all too often fail to think about the engineers who make it happen, the skills they need, and the challenges they face. I maintain that just as you can lead a healthier lifestyle if you have some appreciation of how your body works, so I believe that you can get more out of life if you have some appreciation of how the things around you work. It’s all about maintaining a good relationship between what we understand and how we act, between what we know and what we do. The media doesn’t always help in the way I personally think that it should. Almost all the national media have science correspondents, technology correspondents, industry and environment correspondents but none, to my knowledge, have engineering correspondents. Why is that? Why is engineering not thought to be worth covering and so rarely mentioned? It seems particularly odd when most of our universities have excellent engineering departments but few technology departments. Am I ‘hair splitting’? I don’t believe so. In my view the reasons are deep seated. I believe that there are profound confusions about the nature of engineering and its relationships with science, technology, mathematics, art, craft, and medicine. It’s not just a British thing – though I think engineering is valued more highly on the continent of Europe. For example there is no Nobel prize for Engineering though there is one for arguably the sister profession of Medicine. The recently announced Queen Elizabeth $1m Prize for Engineering will hopefully fill that gap. Technology sections today are predominantly about digital technology – the latest gadgets such as iPads and 3D TV. Science sections are about the exciting experiments at CERN and the search for the Higgs boson and stem cell research that promises so much. Yet in my view, engineering is dismissed as merely ‘applied science’ or ‘dirty hands’ trade. Yet no one would seriously call a medic an applied biologist or a lawyer an applied social scientist. Doctors, like engineers, use the latest science but the practice of medicine, like the practice of engineering, is much more than simply applying science. Of course, science and engineering go hand in hand and both depend on each other. For example, there is large scale engineering at CERN and, on the other hand, my heart pace maker that keeps me going is only possible through the science of the transistor and subsequent micro chip technology. My passion is to help people find out more about what engineering is, what engineers do and how it all relates to what many now refer to as a collective of science, technology, engineering and maths (STEM) as well as art, craft and faith. For example the word ‘engineer’ derives not from dealing-with-engines as one might expect but from the Latin ‘ingeniarius’ which means ‘ingenious problem solving’. Engineers solve problems to provide for human needs. To do it they have to be creative, innovative and practical so that the solutions they come up with are fit for their intended purposes. The tools that engineers create range from simple levers and pulleys to computers and mobile cell phones, from the mundane like a valve to the exotics of jet engines and integrated circuits containing millions of transistors. Engineering is worth our attention – we need it and we need more of our best people doing it as we face modern challenges, not the least of which are the effects of climate change. Professor Blockley is an engineer and an academic scientist. He has been Head of the Department of Civil Engineering and Dean of the Faculty of Engineering at the University of Bristol. He is a Fellow of the Royal Academy of Engineering, the Institution of Civil Engineers, the Institution of Structural Engineers, and the Royal Society of Arts. 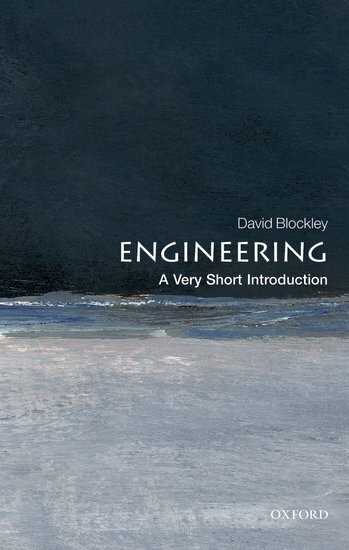 Engineering: A Very Short Introduction published in March 2012.
thank you David. it is good to emphasise what Engineer means in Latin because I think the name is one of the problems. Many people associate ‘engineer’ with engines and that is why people that fix washing machines etc are sometimes called engineers!